Great value for a great multi vitamin. 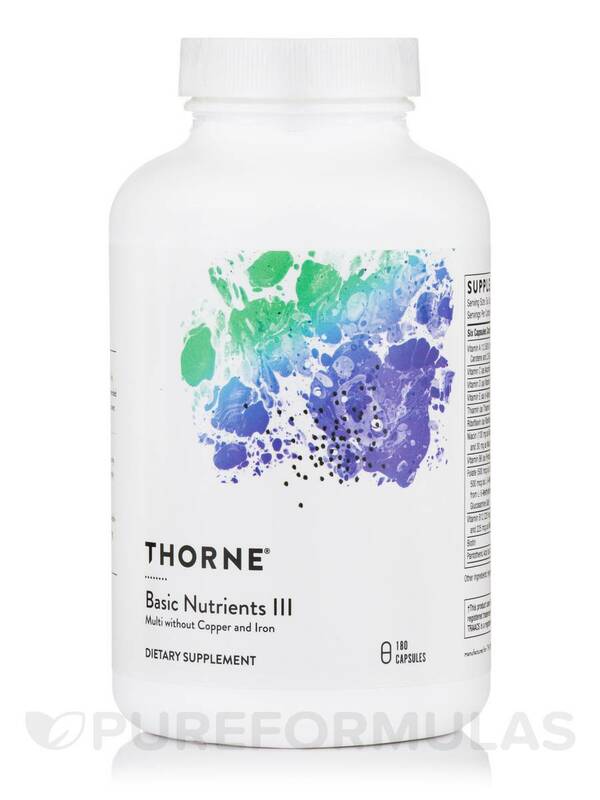 Basic Nutrients III‚ by Thorne is a truly comprehensive multivitamin that does not contain iron or copper. What it does contain are the basic nutrients that are essential for the body to function at peak performance. 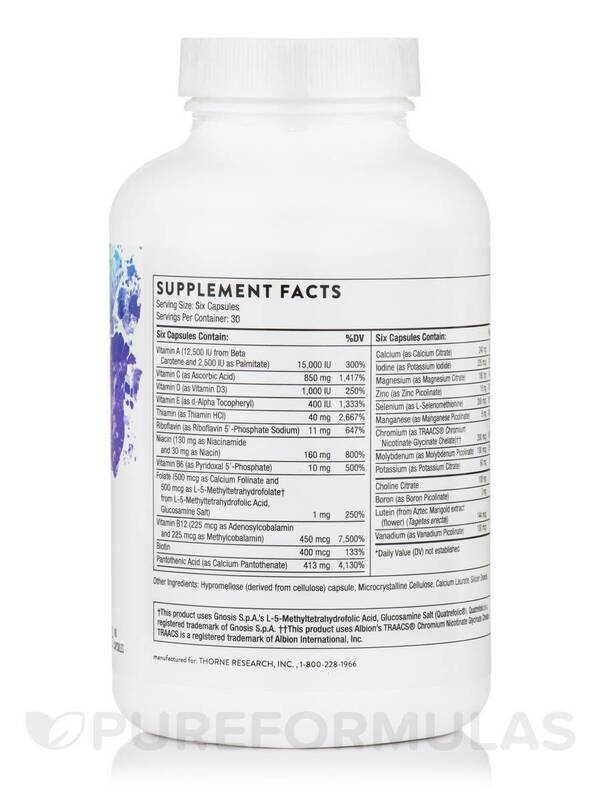 The folks at Thorne believe that such a basic‚ yet comprehensive supplement should be the starting point for everyone’s supplementation needs. This multi-vitamin and mineral combination provides calcium‚ magnesium and potassium (as citrate mineral chelates). Aside from providing these minerals in well-absorbed chelates‚ the added citric acid also has its own health benefits. It is involved in the Krebs cycle‚ which is also called the citric acid cycle and is crucial for energy production‚ and is essential for metabolism. Citric acid has also been known to inhibit calcium oxalate and phosphate from ending up in the urine‚ keeping more of these essential minerals in your body. Basic Nutrients III includes all of the essential trace minerals with the exception of copper and iron. This is because not everyone needs to supplement with iron and copper and‚ for those individuals‚ excess exposure can be dangerous. Women who have undergone menopause and most men are not encouraged to take iron supplements without approval from their doctor. Also‚ most other people do not need to supplement with iron unless they have a specific condition that causes anemia. Copper is certainly an essential cofactor for many bodily enzymes‚ but some people have to be careful about their intake due to overexposure. Copper toxicity can be caused by certain diseases or from external exposure to copper (copper plumbing‚ for example). In some instances‚ both iron and copper can act as pro-oxidants (the exact opposite of antioxidants)‚ so it is safer for the general population not to supplement with either unless they have been instructed to do so by their doctor. 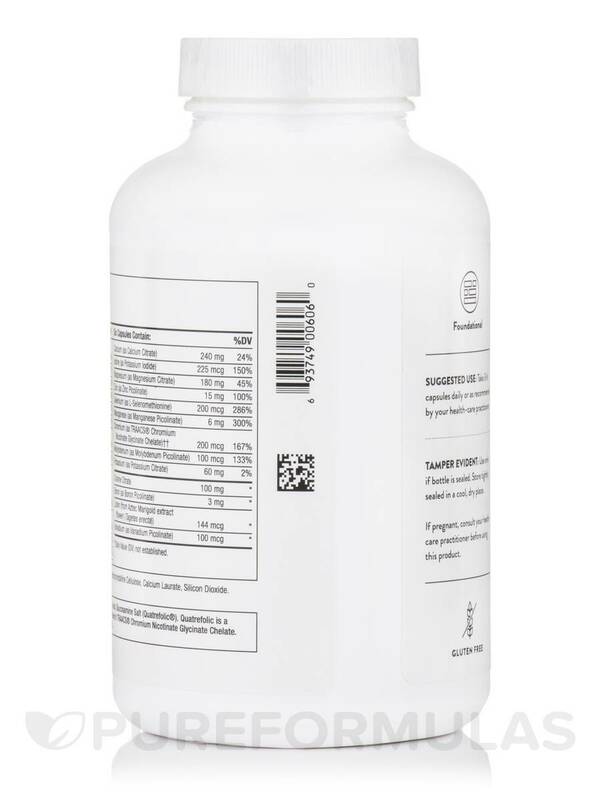 This multivitamin by Thorne provides the active and usable forms of vitamins B2‚ B6‚ and B12‚ as well as chromium as an easily-absorbed nicotinate glycinate chelate. You’ll find that this Basic Nutrients product is free of hidden preservatives and pre-diluted ingredients. It provides active folate (in the form of calcium folinate and L-5-methyltetrahydrofolate in a balanced ratio). Why Is a Good Multi-Vitamin and Mineral Supplement Important? There are many schools of thought when it comes to nutrition‚ but there is one thing that just about everyone agrees on – few Americans get the proper vitamins and minerals from their diet. In order to do so‚ each person would need to eat five daily servings of fruits and vegetables. Recently‚ the Journal of the American Medical Association‚ who historically has not supported supplementation‚ has agreed that everyone should be taking a multivitamin. Even if you think you might be getting enough nutrition from food‚ you can think of a good multivitamin and mineral as dietary insurance – a backup‚ just in case you are lacking in one essential nutrient or another. ††This product uses Albion's TRAACS® Chromium Nicotinate Glycinate Chelate. TRAACS is a registered trademark of Albion International‚ Inc.
Take 3-6 capsules daily or as recommended by your healthcare practitioner. Tried Basic Nutrients III without Copper and Iron by Thorne for the first time, will get it again! Thorne seems to have good, consistent quality. No magnesium stearate. Higher level of B's than other multi's. 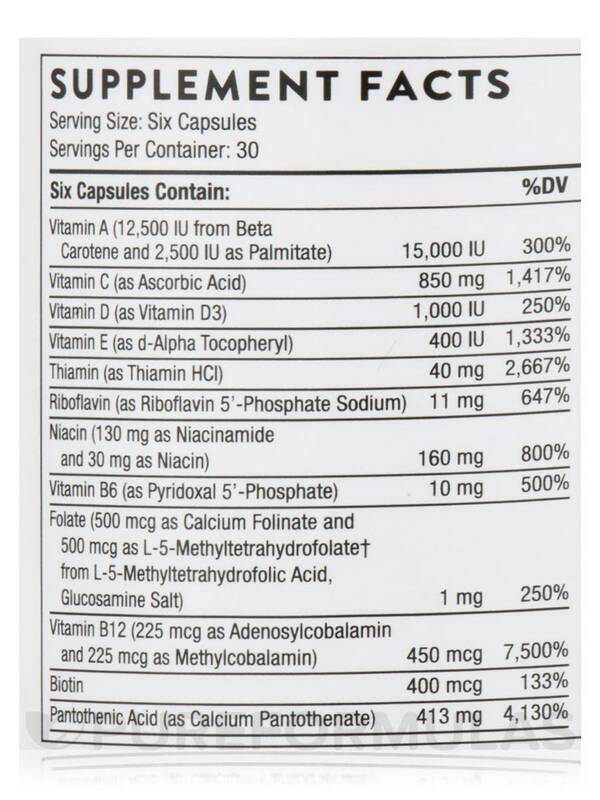 Six capsules to get full serving Thorne items are not cheap. 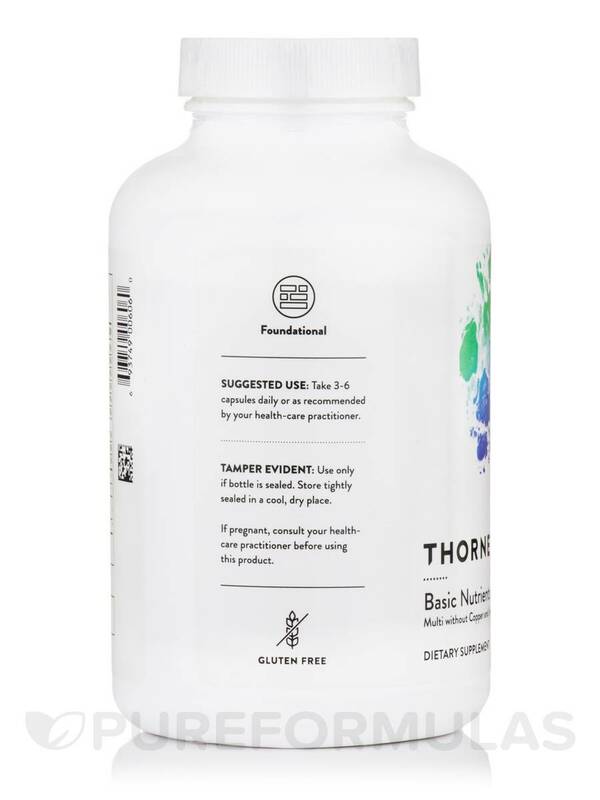 Thorne Research seems to be one of the best quality manufacturers out there and PureFormulas does an exceptional job of processing my order of Basic Nutrients III without Copper and Iron, and delivering it. High quality. Pricey but worth it. I have taken Basic Nutrients III by Thorne Research for 15 years + and have always felt peppy and healthly! Healthy with Basic Nutrients III. I have been taking Basic Nutrients III by Thorne Research for many years, and I could give up all other supplements then Basic Nutrients III keeps me healthy. Basic Nutrients keeps me healthy, and free from a sore body. Can't think of anything that I dislike about this product. Ordered Basic Nutrients III by Thone Research to help get all of my nutrients in because I have IBS and Gastritis. Gentle on my stomach and no addatives or fillers. Order this product monthly. Best multiple I have found so far. 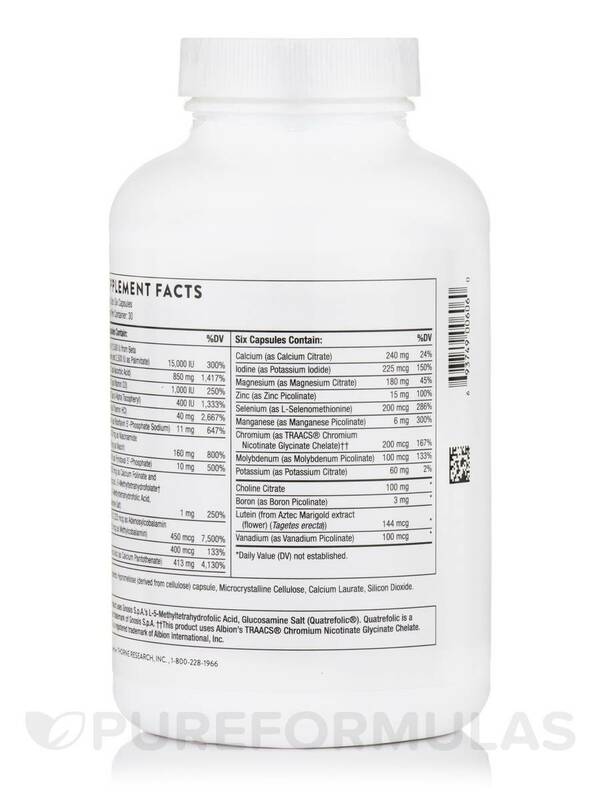 Basic Nutrients III without Copper and Iron by Thorne Research was recommended to my boyfriend who has MS, and I tried it too, it is by far a superior supplement in that is readily absorbed by the body better than most I have tried in the past. This is a superior product. Really like being able to purchase Basic Nutrients III by Thorne Research without copper or iron. And I appreciate the purity of Basic Nutrient III, recommended years ago by my naturopath. I like Basic Nutrients III w/o Copper and Iron by Thorne Research brands as they don't include ingredients that are not good. 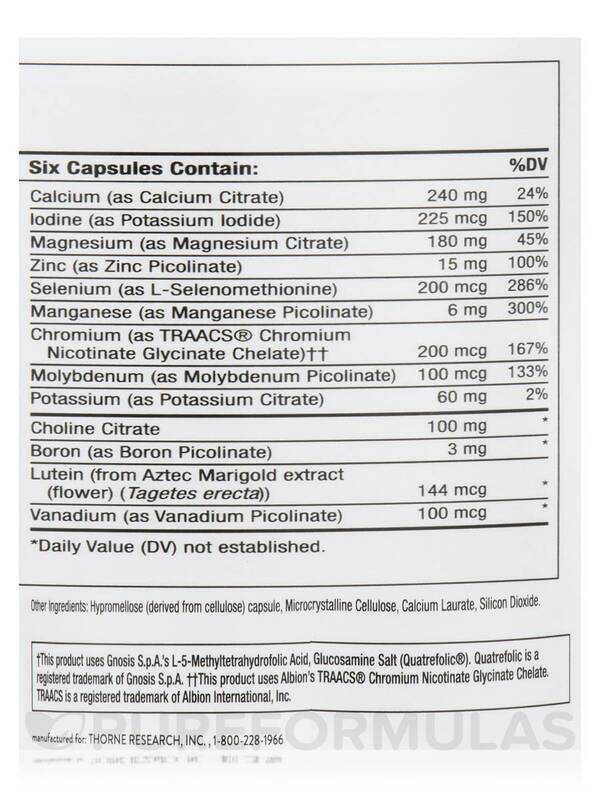 Because the dose of Basic Nutrients III by Thorne Research is 6 per day, I can adjust the dosage throughout the day. I take 2 when I first wake up and go from there. Sometimes I'll take 1 before bed if I am run down. 6 a day let's me vary dosage. I took a whole foods supplement for many, many years, since my mid-twenties. I stopped taking it several years ago after deciding there is no solid research that advocates the benefits of taking supplements. Well, I've decided to take some supplements (again) in the hope that my under active thyroid can be tamed, and some of its symptoms (extreme fatigue, painful thumb joints, etc.) can be alleviated. The fatigue can be severely crippling some days, and I am NOT liking that symptom!!! 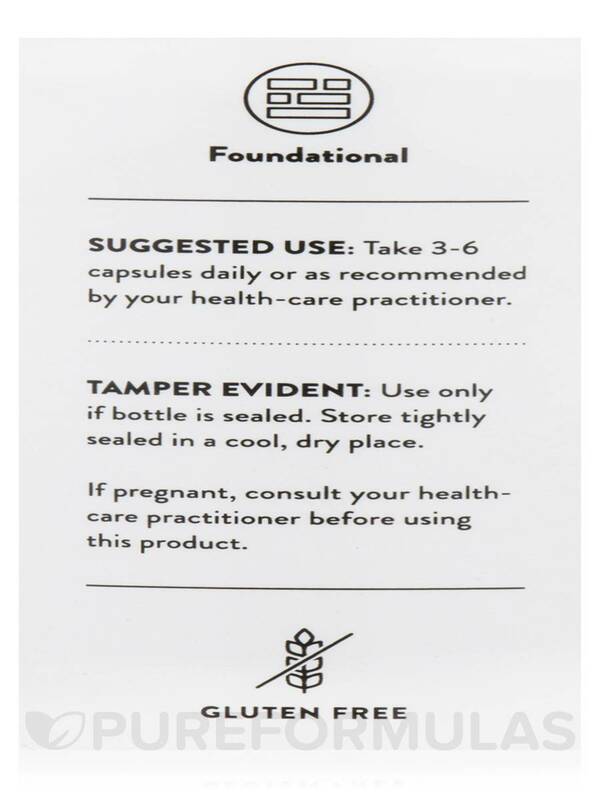 So, after much research, and the advice of a friend who has had wonderful health success with a naturopath physician in Wichita, I've decided to start with two basic supplements -- Thorne Research Basic Nutrients III (w/o copper and iron) plus a quality Omega-3, Carlson Super Omega 3 Gems (500mg EPA/DHA). After taking these two supplements for only 5 days, I am noticing a definite improvement in my overall energy, stamina and endurance, along with reduced pain in my thumb joints. In addition, my overall mental attitude and motivation seem to be improved too! To start slowly and avoid any possible digestive upset, I have been taking only 2 multivitamins and 1 fish oil capsule daily. I intend to increase that to 3 multivitamins and 2 fish oil capsules within the next few days. Why is Thorne Research's Basic Nutrients III w/o copper or iron indefinitely out of stock? Thank you for choosing Pureformulas.com. We do apologize but Thorne Research have decided to discontinue to sell us it's products. Have a happy and healthy day.